The Harry Ransom Center’s photography collection is one of the world’s largest and most comprehensive, and it is continually growing. Look Inside introduces nearly 200 of the Center’s newest acquisitions, tracing photography from its unprecedented post-war expansion to its central position in contemporary art. 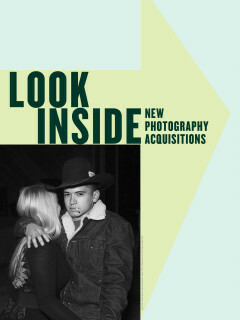 Look Inside features groundbreaking photographs by Thomas F. Barrow, Lee Friedlander, Betty Hahn, and Robert F. Heinecken, contemporary investigations into the medium by Marco Breuer, John Chiara, Alison Rossiter, and Penelope Umbrico, and extended documentary projects by Alejandro Cartagena, LaToya Ruby Frazier, Louie Palu, and Alec Soth. The exhibit runs until May 29, 2016.